Another half-done press release – where's the science citation? | Watts Up With That? Another half-done press release – where's the science citation? IMAGE:This is thawing permafrost on the North Slope along the Sagavanirktok River near Deadhorse, Alaska.Click here for more information. AMHERST, Mass. – In a new study reported in Nature, climate scientist Rob DeConto of the University of Massachusetts Amherst and colleagues elsewhere propose a simple new mechanism to explain the source of carbon that fed a series of extreme warming events about 55 million years ago, the Paleocene-Eocene Thermal Maximum (PETM), and a sequence of similar, smaller warming events afterward. The new view is supported by calculations estimating interactions of variables such as greenhouse gas levels, changes in the Earth’s tilt and orbit, ancient distributions of vegetation, and carbon stored in rocks and in frozen soil. He and colleagues at Yale, the University of Colorado, Penn State, the University of Urbino, Italy, and the University of Sheffield, U.K., designed an accurate model―elusive up to now―to satisfactorily account for the source, magnitude and timing of carbon release at the PETM and subsequent very warm periods, which now appear to have been triggered by changes in the Earth’s orbit. Earth’s atmospheric temperature is a result of energy input from the sun minus what escapes back to space. Carbon dioxide in the atmosphere absorbs and traps heat that would otherwise return to space. The PETM was accompanied by a massive carbon input to the atmosphere, with ocean acidification, and was characterized by a global temperature rise of about 5 degrees C in a few thousand years, the researchers point out. Until now, it has been difficult to account for the massive amounts of carbon required to cause such dramatic global warming events. To build the new model, DeConto’s team used a new, high-precision geologic record from rocks in central Italy to show that the PETM and other hyperthermals occurred during periods when Earth’s orbit around the sun was both highly eccentric (non-circular) and oblique (tilted). Orbit affects the amount, location and seasonality of solar radiation received on Earth, which in turn affects the seasons, particularly in polar latitudes, where permafrost and stored carbon can accumulate. They then simulated climate-ecosystem-soil interactions, accounting for gradually rising greenhouse gases and polar temperatures plus the combined effects of changes in Earth orbit. Their results show that the magnitude and timing of the PETM and subsequent hyperthermals can be explained by the orbitally triggered decomposition of soil organic carbon in the circum-Arctic and Antarctica. This massive carbon reservoir at the poles “had the potential to repeatedly release thousands of petagrams of carbon to the atmosphere-ocean system once a long-term warming threshold was reached just prior to the PETM,” DeConto and colleagues say. Until now, Antarctica, which today is covered by kilometers of ice, has not been appreciated as an important player in such global carbon dynamics. In the past, “Antarctica and high elevations of the circum-Arctic were suitable locations for massive carbon storage,” they add. “During long-term warming, these environments eventually reached a climatic threshold,” with permafrost thaw and the sudden release of stored soil carbon triggered during the Earth’s highly eccentric orbits coupled with high tilt. The model described in the paper also provides a mechanism that helps to explain relatively rapid recovery from hyperthermals associated with orbital extremes occurring about every 1.2 million years, which had until now been difficult. REPLY: Thanks – But they could have just as easily provided this link or the name of the paper, wouldn’t you agree? It’s like announcing a book with a book review and not giving the title, and how dumb would that be? Meanwhile, on planet Earth . . .
Atmospheric methane concentrations continue to stagnate. Maybe like Harry, they just made it up ! Is this similar to a dog chasing its tail? Or perhaps it’s more like the chicken-egg question. All three, the melting permafrost, a dog running around in a circle and a hen laying an egg could be considered “orbital”situations. Sounds like just another “models all the way down” kind of paper. Will we EVER get a verified and validated climate model? Back when I wrote aerodynamic models, the first question my bosses always asked was “How are you going to validate the results?” Today this same question is always one of the first I ask regarding every model, simulation and computer program development effort that I help manage. But, I guess holding climate scientists to the same professional standards as engineers would be too belittling for them. How long is the residence time of CH4 in the atmosphere, again? This sounds like rather a stretch. The problem that I have with this a similar ‘permafrost will release’ scenarios is that before the permafrost was permafrost is was swamp, sphagnum mosses and other such stuff, it was soft and releasing methane 24 hours a day. Then somehow it froze solid. When if thaws is will not ‘start releasing’ methane it will ‘resume releasing’ methane; and the level of methane that it was releasing before it froze was not sufficient to prevent it from freezing. So how did it manage to freeze in the first place, given that it was already out-gassing ‘massive amounts of’ methane? If extreme warming events around 55 million years involved much greater amounts of carbon than today, why wasn’t the warming irreversible? They keep telling us that today’s warming will soon become irreversible if we don’t do something about it now. So how did we ever have ice ages again after the runaway warming of 55 million years ago with all those positive feedbacks going on? Seems to me this paper explains everything. Well, there’s that little detail about how the CO2 caused the temperatures to rise 800 years before it got released into the atmosphere, but that’s minor. You: Simple boss, I will cross-reference my model with your model . Since your model was accepted as correct then my model can be deemed to be correct:-). Boss: Good thinking! That is just what I did when my boss asked me the same question. The problem is that the great-great-grand-bosses model contained these three lines of code. UMASS Amherst is a great party school. It’s nickname is the ZOO. Nuff said. Not a serious scholarship university. It’s a state run diploma mill. So, that would be the silver bullet that explains why the temperature suddenly plummets despite the *gasp* runaway greenhouse effect caused by the ever-increasing parts-per-million of CO2 in the atmosphere? OK, asuming that 55,000,000 years ago, the permafrost thawed – where are the explanations to demonstrate how things froze in the first place? If Carbon Dioxide and/or Methane levels were so high – where is the computer model to explain the freezing process. To suggest one without being able to account for the other is solving only half the problem. If CO2 levels were higher than today, how come it froze? How do we know that our “artificially high” CO2 levels won’t start a massive freeze, rather than runaway warming? In fact, just which way is SOL going to jump? Southern Hemisphere record cold last winter – now Autumn and counting – of course this will be “only weather” if massively cold, and “runaway global something” if massively warm. What can be asserted without evidence, can be dismissed without evidence. Thank you. One of the great Hitchslaps. You don’t understand. All those olde-tyme abnormal climates are irrelevant. Only our current perfect state is to be defended at all costs, even if it ruins us! – It’s the question the warmists/ alarmists never seem to want to answer…! If the “runaway greenhouse” effect (which underpins the hypothesis of AGW and its political off-spring, CAGW) explains historical warming events (eg. 50,000 ya, the Permian ME event etc etcc.) how does the physics of runaway greenhouse explain the subsequent temperatur declines (eg. ice ages)? Stephen Mosher, Hugh Pepper… anyone…? Hey, here is a possibility – the climate warmed and this caused some permafrost to melt. “…The new view is supported by calculations estimating interactions of variables such as greenhouse gas levels, changes in the Earth’s tilt and orbit, ancient distributions of vegetation, and carbon stored in rocks and in frozen soil. Emphasis mine. I just wish I could apply Walt Kelley lettering to further emphasize what they’re saying and how they describe their achievement, or lack of, in glowing self congratulatory terms. Accurate?! By whose measure or certification. Satisfactorarily account for whatever they think good for CAGW science? Oh yeah! Is this how alarmists get their satisfaction jollies? They design models that satisfy their intentions and then they call the model accurate? As I read their words, they designed a model that achieves results predetermined beforehand. Oh, just because they’ve developed an accurate model and since climate models are, just too simple; these glorious authors have also included niceties such as earth’s tilt and orbit eccentricities. High precision geologic record, wow, that really has a nice ring to it. High precision in relation to what? Geologic records in high latitudes? They’ve reduced and simplified such incredible climate complexities that we simpletons would never understand the details. So, of course, we should just take their word for it. I really do hope that the IPCC uses all of these recent paper wasters as key points in their up and coming new greatest climate frenzy. No matter how the alarmists will shrill and scream, they’re just gonna cry wolf a thousand times too often. It’ll also make sure that the next report will be the last IPCC eco new world order flake job. Has anyone ever measured that increased downward IR yet, compared to let’s say 1950? because this is still like a talk about Yetti. How often do you try emailing/calling the contact listed at the bottom of such press releases for the citation, or better yet, a (p)reprint of the journal article? Examine the press release and see lots of man made hot air! That’s typical ‘climate science’ for you – creating scary hard facts out of dubious, unfounded conjecture. More likely, as reported by Nature on April 27, 2007, the culprit for causing PETM was massive underwater volcanic activity between Greenland and Europe, which released truly gigantic amounts of CO2 over a very short time period and, even more important, kept releasing the gas for almost 100,000 years. If the physics behind the theory of GHG-driven global temperature change is unable to explain past global cooling events, where does this leave the theory of AGW/ CAGW? And if one or more other physical phenomena was responsible for the past global cooling events (solar forcing, for example) would it not be more logical to assume that those phenomena were also responsible for the warming? Have you ever noticed that new AGW papers always seem to stress that they’ve fixed all those big errors everyone now admits were in the old papers, but when you go back to the old papers they also claim to have fixed all the major errors everyone really knew were in their predecessors positions. Of course, when you criticize them, the first thing that pops out of their mouths is that AGW must be right because there is a concenus of expert opinion. CONEY WESTON UK: in a new study reported in Watts Up With That, eccentric SF writer Julian Flood proposes a simple new mechanism to explain the source of carbon that fed a series of extreme warming events about 55 million years ago, the Paleocene-Eocene Thermal Maximum (PETM), and a sequence of similar, smaller warming events afterwards. “The standard hypothesis has been that the source of carbon was in the ocean, in the form of frozen methane gas in ocean-floor sediments,” Flood says. “We are instead ascribing the carbon blip to a reduction of oceanic sink. This was the result of sea erosion into a major light oil reservoir which covered the entire ocean surface with a film of light oil. Reduction in wave breaking, suppression of plankton growth and outgassing by warmer waters explains this event which is being duplicated by the extreme pollution of modern civilisation. Enough light oil is now being spilled down the world’s rivers to coat the oceans every fortnight with a deadly blanket, starving plankton, lowering albedo and altering the physics of cloud droplets. The problem must be tackled urgently,” says Flood. Man, you are using logic. They use dogma and models. Logic is for science, but it has no place in religion (and/or politics). Katherine on April 6, 2012 at 10:32 pm posted it first. Between about 55.5 and 52 million years ago, Earth experienced a series of sudden and extreme global warming events (hyperthermals) superimposed on a long-term warming trend (1). The first and largest of these events, the Palaeocene–Eocene Thermal Maximum (PETM), is characterized by a massive input of carbon, ocean acidification (2) and an increase in global temperature of about 5 °C within a few thousand years (3). Although various explanations for the PETM have been proposed (4), (5), (6), a satisfactory model that accounts for the source, magnitude and timing of carbon release at the PETM and successive hyperthermals remains elusive. Here we use a new astronomically calibrated cyclostratigraphic record from central Italy (7) to show that the Early Eocene hyperthermals occurred during orbits with a combination of high eccentricity and high obliquity. Corresponding climate–ecosystem–soil simulations accounting for rising concentrations of background greenhouse gases (8) and orbital forcing show that the magnitude and timing of the PETM and subsequent hyperthermals can be explained by the orbitally triggered decomposition of soil organic carbon in circum-Arctic and Antarctic terrestrial permafrost. This massive carbon reservoir had the potential to repeatedly release thousands of petagrams (1015 grams) of carbon to the atmosphere–ocean system, once a long-term warming threshold had been reached just before the PETM. Replenishment of permafrost soil carbon stocks following peak warming probably contributed to the rapid recovery from each event (9), while providing a sensitive carbon reservoir for the next hyperthermal (10). As background temperatures continued to rise following the PETM, the areal extent of permafrost steadily declined, resulting in an incrementally smaller available carbon pool and smaller hyperthermals at each successive orbital forcing maximum. A mechanism linking Earth’s orbital properties with release of soil carbon from permafrost provides a unifying model accounting for the salient features of the hyperthermals. Publication. No free version found. All pdfs downloaded fine for me. Exactly, this is crap science. The whole concern about melting permafrost or tundra is silly. Where the hell do they think the organics came from that are frozen. And no, there is no accumulation over time, it is frozen, nothing grows/grew after it froze. It used to be warmer closer to the Arctic, but I suspect it will go through another glaciation prior to thawing to a previous state. The temperature trend over this interglacial is down, and no gas fantasy is going to change that. Sounds like what I do each year to the IRS. I design a scenario to satisfactorily account for lower income and higher expenses in order to pay less taxes. Of course the scenario is based solely on how much I think I can fool the government without raising a red flag. HMMMmmmm Seems the good DeConto is telling us the only thing we can do is FILL IN THE SWAMPS! 1972 is when the UN’s first Earth Summit occurred and the push to protect wetlands around the world happened. Prior to this time period people were filling in swamps and killing off the beaver who dammed up streams to form ponds and swamps. The history of draining and development of swampland dates back to the 1800’s. The city of Boston was built on swamp and coastal land that was filled in for example. Part of the zeal to fill in swamps was to destroy wetlands harboring disease-carrying mosquitoes. In the late 1800s, landowners were encouraged to drain or fill “water-logged” lands by the government. If you look at the Global Temperature Graph you can see the filling in of wetlands from the late 1800s until the 1970s caused the temperature to start plummeting by 1945 and by protecting wetlands the temperature immediately started rising again in the 1970s. Now that we are back in a “natural balance” again the rise in temperature has stopped. Do you think I could get a peer reviewed paper out of that scenario? It makes as much sense, heck more sense than much of the stuff I have seen at WUWT recently. This article being a sterling example. There seems to be no mention of the rapid growth of biomass permitted by the increase in temperature leading to the decomposition and release of these gases. It goes without saying that the temperature rises before such decomposition takes place. That rise permits the growth of the stunted vegetation covering the region. The calculation of the increase in the GHG content of the atmosphere does not consider the uptake of Carbon-Dioxide by the expanding biome. Question: Where do people think the carbon in the permafrost come from? The obvious answer is ‘biomass growth that preceded the permafrost.’ I don’t think “God made it and put it there to fool us.” It grew there when it was previously warmer, *Gasp*. The idea that a thawing North will see a net increase in GHG’s is unfounded. As the carbon content of the soils slowly decreases when it is not productive, even when frozen, the proper interpretation is that the carbon content of thawing permafrost will increase as the vegetation recovers. This is plainly obvious to anyone observing the recovering forests and game animals of the southern Arctic. What I saw was: Orbit>Sun>Warmer>CO2>Warmer . . and an effort to say this time it’s: Fossil Fuels>Warmer>CO2>Warmer. This is the best part: “implications of the study appear dire for the long-term future as polar permafrost carbon deposits have begun to thaw >> due to burning fossil-fuels,<< DeConto adds. A conclusion up front, in search of a proof (not). “Thawing permafrost 50 million years ago led to global warming”What we have in this title is another lead-lag issue. In a most simple model, warming causes thawing. In order to twist this into the inverse, one must postulate an initial warming and response that somehow gets inverted such that the initial warming no longer explains the subsequent warming. A logical explanation of this beyond “trust me” is certainly in order. Are you sure it wasn’t 49 million years ago? It’s interesting how , when the ocean warms up it outgasses CO2 and so , logically it becomes more alkaline , yet at the same time it absorbs more CO2 to become less alkaline. What a creature of wonder the CO2 molecule is. I love how they wield the term “calculations” like a great sweeping, all-curing brush which instantly boosts the [in]credibility of their statements. It was calculated, therefore, it must be robust and scientific. I think what folks tend to miss when looking at the PETM, is the vast and long warming which preceded it. In other words, as has always been the case, even when there has been a ‘bloom’ of GHG, it was preceded by most of all of the warming of the entire period, not the other way around. Also, that, even accounting for said carbon, about 50% of the PETM warming itself is not explicable in that construct. So, it was already warming very significantly, and, the carbon released was not able to be held accountable for approximately half of the warming, even of the PETM itself, and that carbon which was released, did not ‘bloom’ until the event was well-underway. The PETM and other grand warming periods have long been a pain for the CO2-kills-you bunch when they try to foist “the hottest decades in millennia” hyperbole onto us. The temperature-leading-the-CO2 also muddied the message. These, and I’m sure others, are now being targeted by the CAGW crowd. It is ironic that they have had to invoke natural swings in temperature as the mechanisms for these mega-temperature events. “Our planet has mostly been much hotter and more humid than we know it to be today (G.P. this means for the entire geological record), and with far more carbon dioxide (the greenhouse gas) in the atmosphere than exists today. The notable exception is 300,000,000 years ago during the late Carboniferous Period, which resembles our own climate and atmosphere like no other. Indeed, it seems that our climate of today is the oddity!! 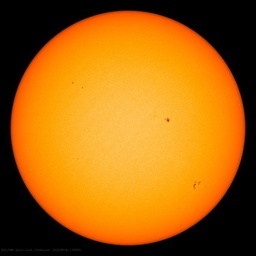 Marvellous thing is, all are now suddenly starting to talk about the sun: now the focus appears to be on trying frantically to hitch CO2 to the orbital cycles, and then somehow relate that to today’s situation. Although the paper is paywalled, the SI (supplemental information) is not. 47 Lunt, D. J., et al., A model for orbital pacing of methane hydrate destabilization during the Palaeogene, Nature Geoscience 4, 775-778. 48 Christensen, T. R. et al., Factors controlling large scale variations in methane emissions from wetlands. Geophysical Research Letters 30 (7), 1414 (2003). 49 Allen, M. R. and Smith, L. A., Monte Carlo SSA: detecting irregular oscillations in the presence of coloured noise. Journal of Climate 9, 3374 (1996). 50 Ghil, M. et al., Advanced spectral methods for climatic time series. Reviews of Geophysics 40 (1), 1003 (2002). 51 Westerhold, T. et al., On the duration of magnetochrons C24r and C25n and the timing of early Eocene global warming events: Implications from the Ocean Drilling Program Leg 208 Walvis Ridge depth transect. Paleoceanography 22, PA2201 (2007). 52 Cramer, B. S., Wright, J. D., Kent, D. V., and Aubry, M.-P., Orbital climate forcing of δ13C excursions in the late Paleocene–early Eocene (chrons C24n-C25n). Paleoceanography 18, 1097 (2003). 53 Röhl, U. et al., The third and final Early Eocene thermal maximum: characteristics, timing and mechanisms of the ‘X’ event. GSA Annual Meeting 37, 264 (2005). 54 Agnini, C. et al., An early Eocene carbon cycle perturbation at ∼52.5 Ma in the Southern Alps: Chronology and biotic response. Paleoceanography 24 (2009). 55 Westerhold, T. and Rohl, U., High-resolution cyclostratigraphy of the early Eocene – new insights into the origin of the Cenozoic cooling trend. Climates of the Past 5 (3), 309-327 (2009). 56 Huber, M. and Sloan, L. C., Heat transport, deep waters, and thermal gradients: Coupled simulation of an Eocene Greenhouse Climate. Geophysical Research Letters 28 (18), 3481-3484 (2001). 57 Marwick, P. J. & Valdes, P. J. Palaeo-digital elevation models for use as boundary conditions in coupled ocean atmosphere GCM experiments: a Maastrichtian (late Cretaceous) example. Palaeogeography, Palaeoclimatology, Palaeoecology 213, 37-63 (2004). 58 DeConto, R. M. et al., Thresholds for Cenozoic bipolar glaciation. Nature 455, 653-656 (2008). 59 Currano, E. D., Labandeira, C. C., and Wilf, P., Fossil insect folivory tracks paleotemperature for six million years. Ecological Monographs 80 (4), 547-567 (2010). 60 Head, J. J. et al., Giant boid snake from the Palaeocene neotropics reveals hotter past equatorial temperatures. Nature 457, 715-718 (2009). 61 Secord, R., Gingerich, P. D., Lohmann, K. C., and MacLeod, K. G., Continental warming preceding the Palaeocene–Eocene thermal maximum. Nature 467, 955-958 (2010). 62 Wang, Q. et al., Climatic change during the Palaeocene to Eocene based on fossil plants from Fushun, China. Palaeogeography, Palaeoclimatology, Palaeoecology 295, 323-331 (2010). 63 Wing, S. L. et al., Late Paleocene fossils from the Cerrejó Formation, Colombia, are the earliest record of Neotropical rainforest. PNAS 106 (44), 18627–18632 (2009). 64 Greenwood, D. R. and Wing, S. L., Eocene continental climates and latitudinal temperature gradients. Geology 23, 1044-1048 (1995). Gail that article sound more reasonable then many I was able to see in reading about global warming. I said since some time that there should be a skeptic’s organised prize for global warming papers, where we select their “best papers”. Shakun’s paper for instance would be a candidate, even if it would have been beaten by that psyco-doc who wanted to heal skeptics – if she had a paper on it. I mean all these deserve some special recognition in a way or another? If extreme warming events around 55 million years involved much greater amounts of carbon than today, why wasn’t the warming irreversible? The PETM (Paleocene-Eocene Thermal Maximum) was over 10C warmer than today, but it was the end of an epoch that was 6-8C warmer already. The Eocene epoch that followed saw the temperature return to PETM levels, in the Eocene Optimum. The Eocene warmth ended 38million years ago when the Arctic Ocean hosted an intense bloom of the aquatic plant Azolla, which crashed the CO2 levels down by a factor of four. As for the PETM itself, everybody assumes if was caused by high CO2 but it was already high anyway. What they overlooked is that the immense inland seas of the Cretaceous dried up at the end of the Paleocene, considerably reducing the Earth’s albedo by replacing sea-cloudiness with the darkness of dry sea bed. Since WUWT has already established that albedo is 15 times more effective than CO2 at controlling Earth’s temperature, this cause seems much more plausible, so much so that paleoclimatologists will assiduously ignore it in favor of their true love, CO2.